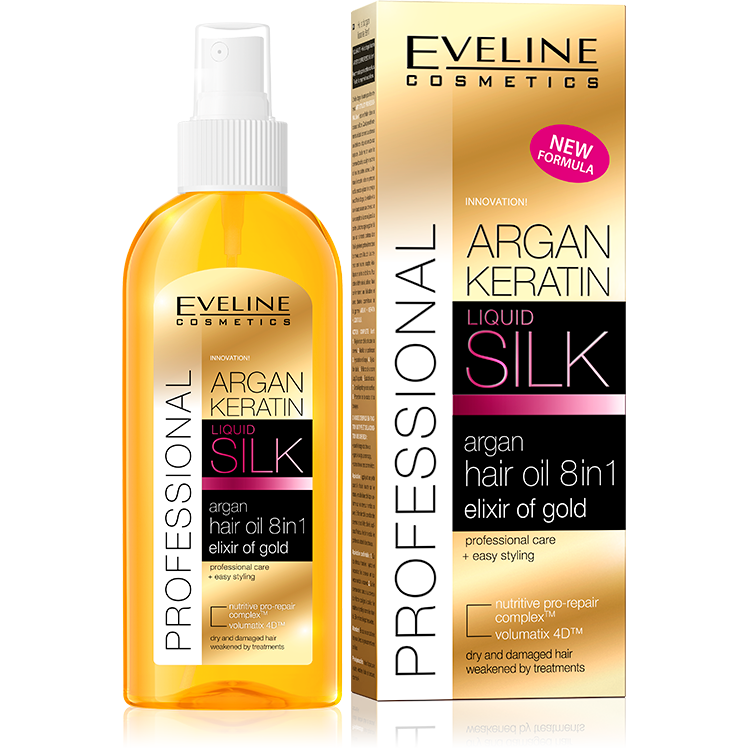 ARGAN • KERATIN • LIQUID SILK series was developed thanks to cooperation of Eveline Cosmetics laboratories with hair stylists. As a result professional line of hair care cosmetics was created. The cosmetics facilitate styling and ensure many hours life for a hairstyle. ART STYLIST PROFESSIONAL 8in1 smoothing oil is a perfect finish for every hairstyle. A few delicate brushes add hair extraordinary shine and silky smoothness. The oil perfectly emphasizes the secret of curls, enhances highlights and smoothes out dry hair ends. Innovative formula rich in advanced active ingredients, acting in synergy with argan oil, keratin and liquid silk gives hair complex care from the roots to the ends. Advanced technology makes nourishing substances contained in the oil penetrate deep into hair, not weighing it down. Hair is nourished, resilient, elastic and full of spectacular shine. To achieve the desired effect use the oil according to the recommendations and together with other cosmetics from ARGAN • KERATIN • LIQUID SILK series. 1. Regeneration of hair structure. 5. Shine from the roots to the ends. 7. Extended life of hairstyle. PARTCULARLY RECOMMENDED FOR VERY DRY, COLOURED AND DAMAGED HAIR. • onto dry hair as a finish.